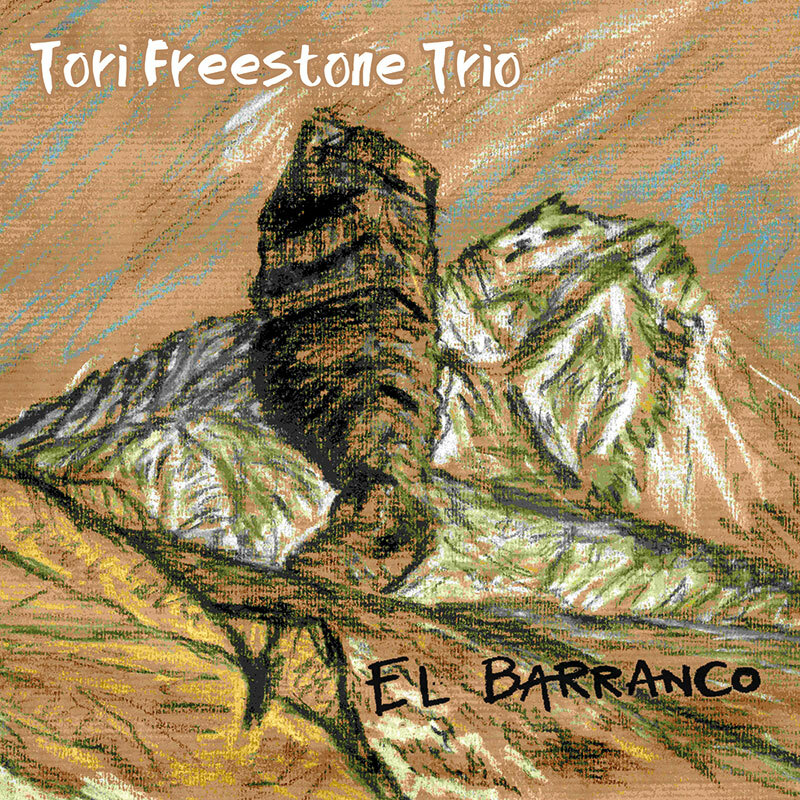 Reaching into the heart of improvised music has become second nature to British tenor saxophonist Tori Freestone and perennial colleagues Dave Manington (double bass) and Tim Giles (drums) on their latest Whirlwind release El Barranco. Following their warmly-received 2014 release In the Chop House and subsequent live appearances, the trio have relished the opportunity to reconvene in the studio to record this collection of intuitive explorations (often first takes) of predominantly original compositions, including a pair of London Jazz Festival commissions. The challenge of the wide-open chordless format is enthusiastically embraced by this trio, offering an improvisational prospect which constantly evolves, thanks to their innate ability to share ideas and spontaneously flex in new directions. 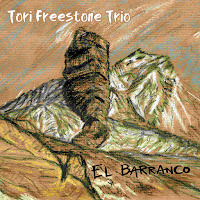 Tori Freestone’s characteristically voluble tenor delivery is a key factor in this artistic process: a continuous channel of flowing, tumbling lines arriving from a seemingly limitless, spring-like source; and the quicksilver responses and diversions of both Manington and Giles are so genuinely realised. All of this combines in creating delightful group unpredictability, via a mutual, carefully crafted musical vocabulary, which happily hovers on the periphery of delineated structure. The concept of creative spaciality is reflected in the saxophonist’s album title and own sleeve illustrations, referencing the beautiful, mountainous terrain of Tenerife – in particular, El Barranco de Masca – which, for many years, has remained especially close to her heart. Thus, the inspiration for opening title track El Barranco arrived almost instantaneously, its airy nonchalance a perfect vehicle for the liquid, intertwined phrasing of tenor and bass, buoyed by an expressive lightness of touch from drummer Tim Giles. The first of two commissions, The Press Gang echoes Freestone's musical roots with a suitably dark interpretation of the gloomy folk-tune tale (reprised as the album's end-piece, in appropriately traditional guise, by way of a haunting vocal-and-violin solo performance); and the full-tilt exuberance of contrasting partner piece Identity Protection further reveals the trio's enthusiastic abandon. Elsewhere, Dave Manington makes two compositional contributions, the thrummed, ‘60s soul bass riff of his Challenger Deep setting up a distinctively alternative groove; and Quetzalcoatlus (purportedly the largest prehistoric flying animal that ever lived) becomes increasingly wild, jagged and audaciously airborne. Arthur Attman’s familiar standard, All Or Nothing At All, is skilfully threaded between the players, Freestone’s mellow tenor fluidity as heartfelt as ever; and the snappy, complex, changeable moods and rhythms of Cross Wired speak volumes about a trio whose creative understanding (contrary to its title) is so impressively fine-tuned.